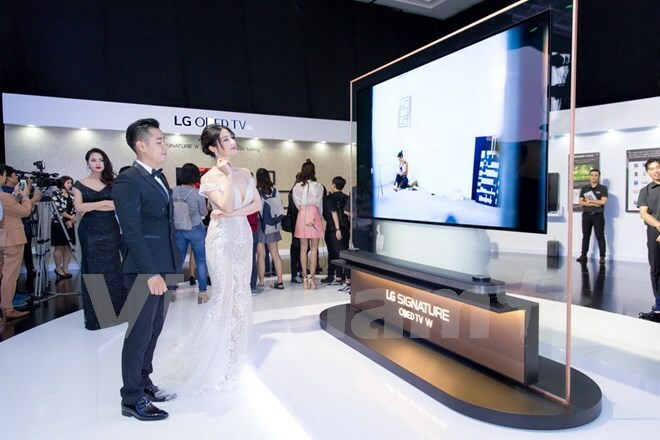 HCM City (VNA) – LG Electronics Vietnam showed off “wallpaper” thin LG Signature OLED W Television for the first time in HCM City on August 15, announcing its 2.57mm-thin panel is the thinnest in Vietnam. The record was recognized by the Vietnam Record Association, a representative from LG Electronics Vietnam said. The super-light flat-screen model is available in Vietnam in 65 and 77 inches, featuring sound bar-style speaker system, webOS 3.5 – the latest version of LG’s smart TV platform, and a wide variety of 4K programming.